TSPSC Junior Assistant posts Recruitment 2018 Notification - Apply Online,TSPSC Junior Assistant posts 2018 Recruitment, Apply Online upto July 2, TSPSC TSRTC Junior Assistants Recruitment 2018: TSPSC has given TSRTC Junior Assistant posts 2018 recruitment notification and Applications are invited Online from qualified candidates through the proforma Application to be made available on Commission’s WEBSITE (www.tspsc.gov.in) to the post of Junior Assistant in In Telangana State Road Transport Corporation (TSRTC) in the State of Telangana. 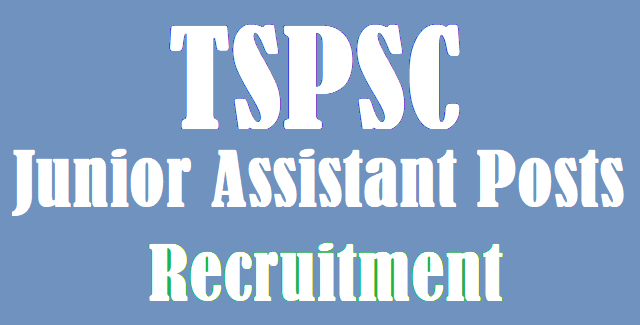 TSPSC Junior Assistants Online application form, How to apply for TSPSC Junior Assistants Recruitment, Last date to apply for Junior Assistants, Application fee, Eligibility Criteria, Junior Assistants Hall tickets download date, Junior Assistants Results date and more details are time to time available at tspsc website. (18-44*) Minimum 18 years & Maximum 40* years. The age is reckoned as on 01/07/2018 (Rule- 12(1)(a)(v) of State and Subordinate Service Rules). (Remittance of Fee) Each applicant must pay Rs. 200/- (RUPEES TWO HUNDRED ONLY) towards Online Application Processing Fee. This apart, the applicants have to pay RS. 120/- (RUPEES ONE HUNDRED AND TWENTY ONLY) towards Examination Fee.